When superhero’s fight in cartoons you see all kind of sound flying around and this t-shirt shirt has the “BAM” on it surrounded by some more cartoon like drawings . 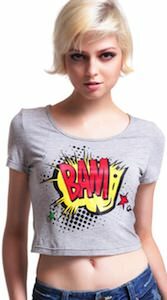 And BAM is what people gone think when they see you where this fun cartoon style women’s t-shirt. The shirt is not long actually it keeps the midriff free showing of you belly button or maybe some jewelry you hide there. The shirt is available in size Small and Medium and is perfect for a hot summer. Come and check out this fun Cartoon Bam Midriff T-Shirt.